Last year, while in Zacatecas, I was bitten by the real estate bug and came down with a bit of a fever. Or perhaps it was just a relapse of a life-long real estate affliction. You see, everywhere I go in America, I grab the free real estate magazines you find in grocery stores or wherever and pore over them. And I fantasize about renovating and what it would be like to live somewhere else. I have spent countless hours fantasy real estate shopping in Mexico too. Especially on winter weekends, I often wake up, brew coffee, boot the computer, and while away the day looking at places in Mexico City on metroscubicos.com, all the while fantasizing about a place where I can be in shirtsleeves all year long. Since I broke up with F nearly two years ago, the Mexican symptoms of the affliction have subsided a bit, but not entirely disappeared. And here in Boston, I don’t fantasize as much since I already have a house which I love, and everything is insanely expensive anyway. So while in Zacatecas last year on my road trip, I wondered what it would cost to buy a house. In my hotel I googled various real estate sites, browsing properties online, and then found a place that looked nearly perfect. Only about twenty years old, the facade (above) looked as charmingly colonial as anything. Yet it had four bedrooms of decent size, two-and-a-half baths, a good-sized modern (though tired) kitchen, a study off the living room, and even a small two-car garage (end-to-end parking) with an automatic door. And it was a mere four blocks from the Zócalo, yet on a quiet street. Best of all? 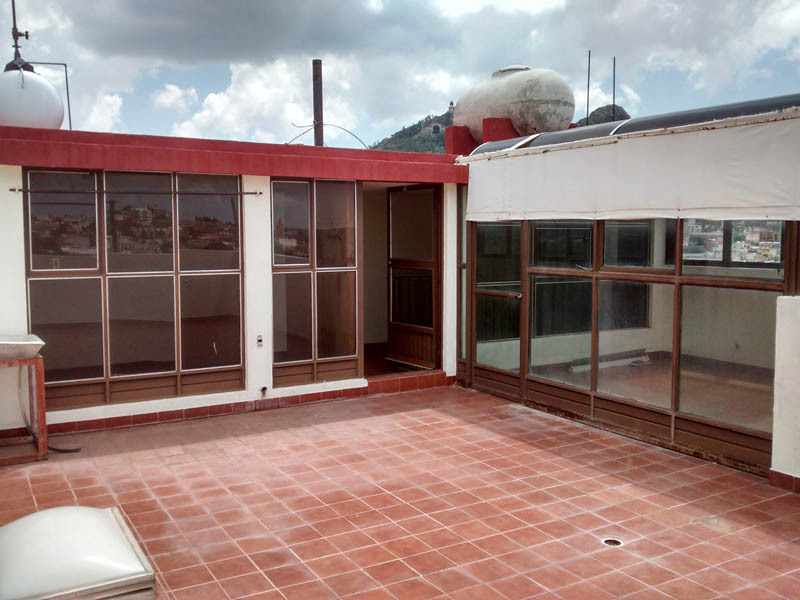 It had a roof deck with a magnificent view of the city, a greenhouse, and a laundry room. The price? At the time, $1,550,000 pesos, at the then-current exchange rate (~13.25 MXN/USD) about $117 thousand USD. I emailed the agent to set up an appointment, and she showed me the property the next day. It was in good, but not great shape, and it was clear that the prior owners didn’t share my taste as the paint on the walls clashed with the floors. Still, that was a minor complaint, and overall it was in certainly livable condition. 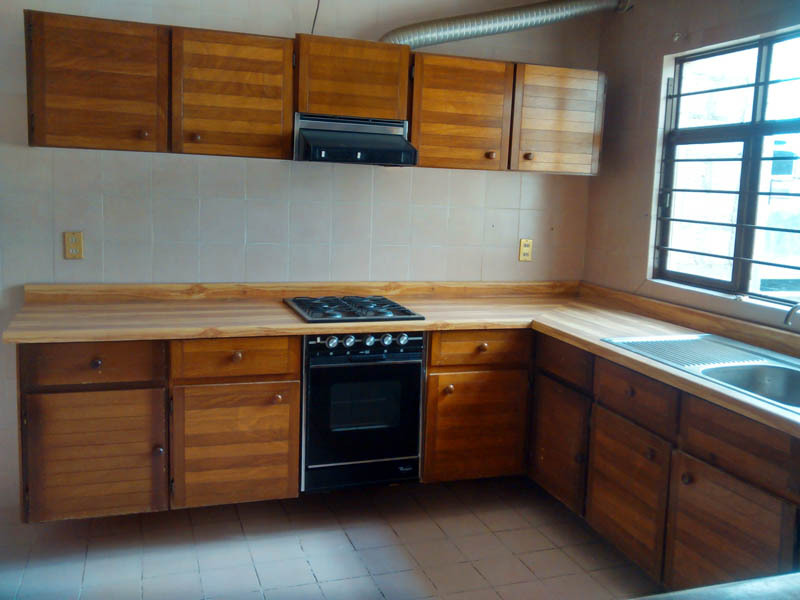 Sure, I’d probably want to re-do the kitchen with its seventies overtones, and fake-wood Formica counters. And the electrical system consisted of a mere two circuit breakers for the entire house. But overall it was a pretty solid place, and at 200 square meters of space (~2200 sq ft), it was spacious, if not over-the-top for a single guy. That Seventies Kitchen. Still, it’s a nice size and has good light. And I half-seriously considered buying it. I love Zacatecas and everything about it. Sitting at 8,100 feet of altitude, it has a warm, dry climate which reminds me of my native California. The sky is an amazing blue with unusually beautiful clouds, and the city itself, at least the historic centro, is probably the most beautiful city in North America. And it’s a UNESCO World Heritage Site to boot. The people are beautiful and friendly, and there are myriad fiestas, parades, clown shows, live theatre, and three excellent museums. Though a small city, it sits midway between Monterrey and Mexico City, about a six hour bus ride for either. Living Room Looks Over the Street. Wall color must change! 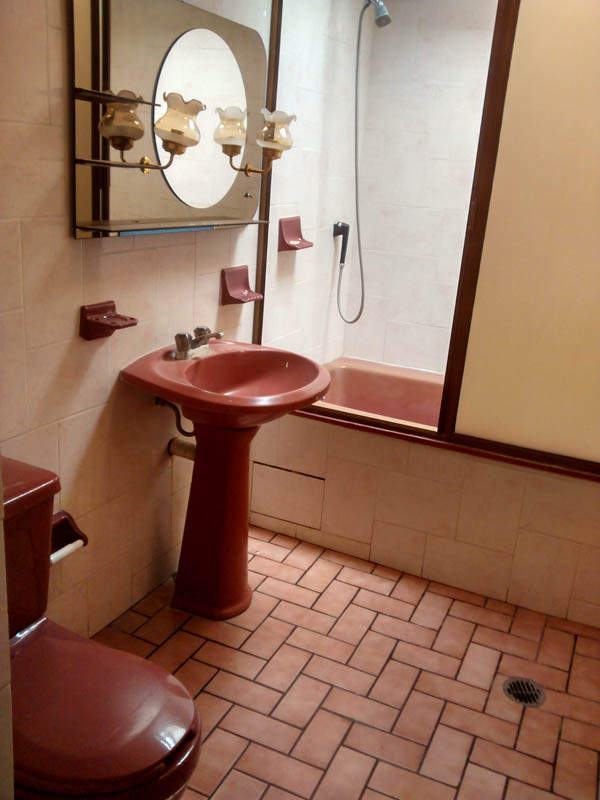 The main bath isn’t bad, but the mirror/light fixture thing MUST go! After looking at the place for about a half hour and chatting with the realtor about the price, I thanked her and left. The next day I packed up my truck and headed north, back to Boston as my trip was coming to an end. Yet I couldn’t help but fantasize about the house, and after I came home, I’d periodically re-check the listing, hoping it was still available. Some time over the winter, the listing disappeared, and I assumed that the house had finally sold. I put the thought aside, and went on with my normal, Bostonian life. Earlier this week, I got an email from Steve Cotton asking, “How go your Mexico move plans?” “Indecisively,” I replied, though with a lot more detail than he probably wanted to read. After I hit “send” on my reply, I really began thinking. I haven’t been back to Mexico since I left in August of last summer. And it feels weird and I miss the country and my friends there. Moreover, I have made zero progress toward either moving there, or really recommitting to Boston. And then today, during a texting chat with Edgar, the topic of Zacatecas came up again. 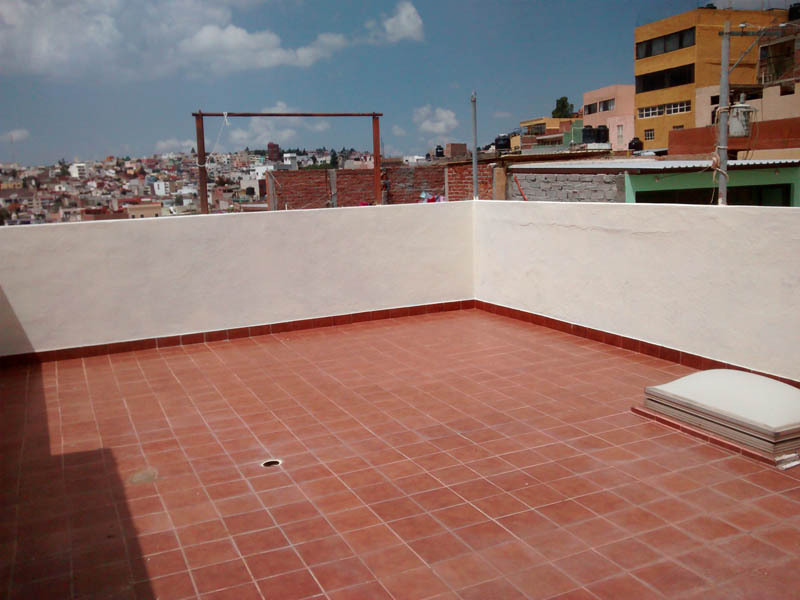 “What the heck?” I thought, so I re-googled Zacatecas real estate, and it was back! The house. 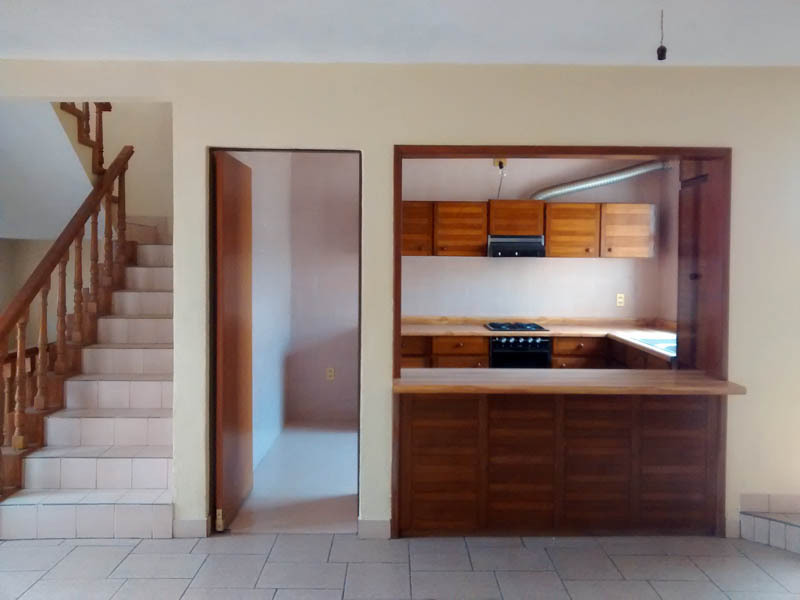 For sale by the same realtor, though now, since it still hasn’t sold, they’ve amusingly decided to raise the price by $100,000 pesos asking $1,650,000 MXN. However, in USD terms, it’s actually now slightly cheaper at $105 thousand USD, given the strong appreciation of the dollar in the last year. So my real estate fantasies are now spinning back at full speed. Financially, I could easily swing the purchase of that house. But the fact that it has been on the market for about a year, possibly longer, makes me think that even the old price was too much. And I can’t possibly believe that the main (or even minor) market for that house is foreigners, so in my mind there’s no possible justification for a price increase. I’m one of the very few foreigners I’ve ever seen in Zacatecas. As for the price, while I’m OK with the idea of a possible, longer-term loss on the house, I don’t want to be underwater the minute the ink on the contract dries. And as I write, the peso is plummeting in the foreign exchange markets, so there’s that risk too. More importantly, could I actually live in Zacatecas? In some sense, buying a house there would be absolutely nuts. If it’s even the right word, the number of people I “know” in Zacatecas can be counted on one hand: Enrique; David, a gay hairdresser who cut my hair twice on my road trip; Luís, the Chicago-bred but Mexican bellboy I befriended at the hotel where I stayed; and a couple of guys I met along the way. I suppose I could also add the agent, Sandra, to this list too, if only to underscore its tenuousness. So socially, I’d start from approximately zero. As for accessibility, Zacatecas is nowhere near a major airport. It’s a provincial state capital, with only 138,000 people. There’s no expat community. Could I possibly fit in? David, the hairdresser, provided me some insight on this question while he cut my hair. A native Zacatecano of about forty, he escaped Zacatecas in his younger days and moved to DF which he enjoyed tremendously. But he moved back to Zacatecas a couple years ago as his parents were getting older and he felt he should be closer to them. “The people here are very Catholic,” he told me, rolling his eyes. Very narrow minded. I can’t imagine why you’d want to live here. If it weren’t for my parents, I’d be back in DF. Still, there is one fairly large gay bar in town, and there has been at least one gay pride march there, so I’d not be the only “out” gay in town. Luis, on the other hand, seemed to be very happy to be out of Chicago, and was loving living in Zacatecas. For him, it was one big party, and he had lots of friends, including a girlfriend. Though he had Mexican and American citizenship, his accent in English was totally American, though oddly African-American ghetto. I suspect that where he grew up in Chicago wasn’t exactly a lovely part of town. So I’m sure that colors his view of Zacatecas. And the others? They seemed happy enough to be in Zacatecas too. But for me, it’d be a huge change in lifestyle, with positives and negatives. On the positive side, I’d be much closer to a sort of more urban life, being easily able to swing out to the Zócalo for a coffee break during the day, and wandering out to restaurants at night. Though I live in the city of Boston, I’m in a suburban-like setting on a park, and it’s pretty quiet here during the week. Stores and such are a fifteen-minute walk away, and while nice enough, they’re not exactly World Heritage Site material. Sure, there are plenty of big-city amenities, world-class museums, and the Boston Symphony a subway ride away, but I’m not at all in the thick of things in Boston, which is fine since I love my neighborhood, and have lots of friends here. But a Zacatecan life in that house would be more urban and closer to the city’s main attractions, despite the smaller city size. No yard to care for, a one-minute walk to the center of the city, and tons of festivals and the like within spitting distance all create a sense of urbanity. I’m totally torn about this house. My impulsive half just wants to buy this place now and start the remodeling. But my practical half, which usually wins these battles, counsels caution. Given the price hike in the face of no sale probably means the seller is unreasonable. I can make a fairly convincing argument that the peso is likely headed lower, especially next year when Mexico’s federal government begins to feel the pinch of lower oil prices and may need to increase borrowings or taxes. (Pemex is hedged through about September, but needs to re-hedge then.) US interest rates are rising, which puts upward pressure on the dollar. And if US rates fall, that’ll be due to a material slowdown in the economy or a recession, which has never been good for the peso. So where does that leave me? Back in indecision-land without a map. Wish me luck! I’ll need it. And please do comment. I’d love to get some other perspectives. Saludos! What did you decide to do? I am thinking about the same move. I’ve been you zacatecas before and loved it. Well, ultimately I didn’t buy the place. And then in 2016 I moved to Mexico City. You might enjoy this post where I write Zactecas a “Dear John” letter. Sadly, I’m back in the USA. Here’s an update. Sadly the last couple of years for me have completely derailed my life, but I’m hoping to get it back soon. Cheers and thanks for commenting! My husband and I visited Zacatecas This fall and fell in love with the charm of the city! How did you reach an agent, or figure out a way to see postings of available homes for sale? I have family that lives in surrounding towns snd before I reach out to them I was hoping you would have some links to share about real estate. Hola Sofia! Sorry for the tardy response. Future comments should go through without moderation. As for Zacatecas real estate, in truth, I don’t remember exactly how I found the house I wrote about. However, there are lots of Mexican real estate sites. You can check out propiedades.com, metroscubicos.com, casas.trovit.com.mx, http://www.vivanuncios.com.mx or any number of other sites that you can search for. Thanks for your comment and saludos! Came across your article a couple years late. Did you ever visit Zacatecas? We are considering a house in Jerez. I wrote that piece while staying in Zacatecas. I’ve been there a couple of times. Be sure to see the post about Jerez. I think you’ll like it. Saludos, Tocayo! Next comment will go straight through. Hey, Nice reading your ponderings. My husband and I (both men) just got back from a quick trip to Jerez and Zacatecas. He grew up on a ranch outside Jerez and recently inherited his parents home there. Currently we live in LA. Zacatecas was beautiful. We’re considering what it would be like to live in the area, at least part time. Have you been back? Sorry to latch on to your comment. How did you feel about safety in Jerez? We are considering buying. Hi Kim, I’m not sure if Franz will likely reply. But check out the post on Jerez. My guess is that it’s pretty safe. Saludos. I felt very safe in Jerez, but I only spent a few days there. Folks were incredibly nice and accommodating. I’ve actually got a place in DF now. And of course the subject of this post has long ago been sold, haha. Good luck in Mérida. It’s hot as hell, but there’s a nice gringo expat community there. Saludos and thanks for stopping by. P.S. subsequent comments with the same email/username will be published immediately. My dear friend! We met while you were traveling through zac! I was with my husband and you took us to lunch in Jerez! I found this post simply because I am dreaming of zac real estate myself, when I googled zac real estate this was the first hit!!!! So much has transpired since we met. We moved home from Mexico and unfortunately have been separated for the last two years. My hope is for us to reunite and our daily conversation would make one think it’s possible but 2 years apart can really distance two people. I still dream of owning a piece of zac, it was my home for quite some time. I pray you choose the dream that will bring you the most joy and allow you to add the most value to your life and to others! Be well! Wow! What a pleasant surprise to see your comment here. I don’t know if you read the post I wrote about my experience meeting you and your hubby that day. But it was amazing for me. I’m so sorry to hear that you are separated, but hopefully you can reunite. Good luck with whatever your plans may be. Saludos y un abrazo! Is there some reason why you wrote this? Indeed. Did you read the whole post? Any other parts of the blog? Hi! I am wondering if you ended up moving to Zacatecas? I currently looking at living there and my friend as well. Visited a few times and love the area. Any pros and cons?? I never moved to Zacatecas, though I do continue to fantasize about it. I ended up renting an apartment in Mexico City, where I spent the first 8 months of 2016. I’m back in Boston for now, but still fantasize about Zacatecas. See the post “Dear Zacatecas.” Saludos and sorry for the long delay in answering your comment. Why don’t you just buy Sr. Zapata’s D.C. apartment (if they’ve cleared the title yet) & the Zacatecas house. Then you could have both worlds. I share Zapata’s wife’s love of Zacatecas. It and Guanajuato remain my two favorites after spending time in most of Mexico. Hola Larry! Next time you leave a comment, it won’t get moderated. As for Sr. Zapata’s apartment in DF, good idea, though it’s not really where I’d want to have a place in DF. Still, I think you’re on the right track as I don’t think I could probably live full-time in Zacatecas, but it is still an amazing place that would be great for spending, say, the winter. Saludos and thanks for stopping by! If not full time in Zacatecas, where would you spend the rest of the year? DF? MA? Saludos. Hola Tino! Well, summer here in Boston is simply mahvellous. So that’d be the first candidate for part of the year. But DF, Monterrey, traveling, who knows? As you can tell, the biggest question in my mind, something this post and my lovely commenters have really helped me to focus on, is whether I could indeed be happy living in Zacatecas. I’m not sure I have the answer yet, but I am thinking intensively. Thanks for stopping by again, and for your multitude of helpful comments. Saludos! If you’ll send me an offline email, I’ll send you an entry from my old blog when my daughter and I toured Mexico in our funky old RV named “The Beast.” (The entry is very naive — thus my reluctance to include it here.) We had an amazing adventure there and it was our first stop in Mexico. The next year I went with my wife in the same old RV and again had a wonderful time. I agree with Sr. Zapata that a knowledge of Spanish would be a must in order to settle in there. Unfortunately, I do not have the knack at learning languages. (Every time I take Spanish lessons, I have to start all over.) Also, we’ve not been there during the dry season. Not sure the desert life would be as great as Michoacan or Guanajuato. Or for that matter… have you checked out the Veracruz area? We loved Xico and Lake Catemaco. As an aside on Zacatecas… my daughter and I sat across the street from the main Catholic church and counted those who crossed themselves as they passed, either in cars or as pedestrians. Our best estimate was 80%. Hola Larry! I’ll email you. I’m not sure why this comment went to approval, perhaps a typo in the email address? Saludos and thanks for stopping back. I’ve been to all of the above places, Ajijic most recently while looking for a retirement home for my elderly mother. In truth, what Ajijic offers is a tight Gringo community, the ability to easily get by with zero to minimal Spanish, good foreign (e.g., not Mexican) restaurants, nice climate (a smidgen warm for me, but only a smidgen), and a beautiful location. The city itself, though, is not charming at all, though a bit funky. Thanks for your comment. Future comments will go through un moderated. Saludos! PS. So so glad to see you posting again. PLEASE keep it up…….. Thanks, Barbara. You are *too* kind. You KNOW what I’m going to say – rent for the first year, a furnished place. If that house is still there then its meant to be. Just remember that once you pay cash, that cash is a dead asset as you can’t borrow against it or anything. Renting is always cheaper. It’s easier to leave if it doesn’t turn out to be where you want to be…..why tie yourself down? Secondly, at 8100 ft. elevation, it will be a lot colder then SMA at 6400 ft elevation. You can’t look at the outside temps and think that is not cold. Remember, nothing has central heat in Mexico that I know of………..or central air. To my eye, the photos of that house look fine. The kitchen is very modern and nice compared to what one usually sees unless you’re trying to recreate a USA home. And, if that is the case, then why not just stay in the USA? Live the Mexican experience. There is so much to see and do! Hola Barbara! Renting makes a ton of sense, though I’d like to own more real assets in my life. I’m a little worried about what inflation might do in a couple of years, and there’s no protection from that like real estate. That said, Zacatecan real estate may not be the best hedge around, LOL… As for the climate, you are absolutely right. I’m a little more worried about chill than heat, as the extra ~1,500 feet of altitude means average highs and lows will be lower. People I’ve talked to there say it can get frosty during January nights. And I don’t want to be cold in the house, and the walls appear to be uninsulated (like every other place in Mexico). But I could get a fleet of those 2-drawer-filing-cabinet-sized propane heaters. Or a big propane heater in the living room, maybe a gas-fired “wood stove.” But realistically? It’s going to be warm all winter long compared to Boston, though I do take your point about indoor temperatures. Here I’ve got lots of insulation and central heat. As for the house, yes it’s very nice by Mexican standards, and OK by US standards. I think I’d be likely to try to re-use the existing kitchen cabinets with new doors, a new countertop, and maybe a higher-end stove. I like to bake pizza and that requires a hellishly hot oven to get a decent crust. The rest of the house? Aside from paint and some very minor stuff, I think it’s pretty nice the way it is. As for “living the Mexican experience,” Zacatecas would have a *lot* to offer in that regard. There’s hardly a gringo face there, and it’s far from DF, so it seems very authentic. I really love the place. So we’ll see what happens. Thanks for stopping by and commenting! Saludos! Zacatecas a very peaceful city, and that is good but makes me wonder if you won’t get tired of peaceful after a few months? I hope not. Hola Tino!!! Thanks for your thoughts. So by “peaceful” do you mean little violence? Not that I’m afraid, but certainly the larger surrounding area has had its own issues with rival drug gangs. I personally wouldn’t worry about it in the center of town, but various taxi drivers have told me a tale or two. And yes, the proximity to Monterrey is a big plus in my view. Not only could I go see you two fairly easily, you’d of course be welcome any time whether I was there or not. There really is something magical about Zacatecas that’s hard to put a finger on it. But you know, since you’ve been there, that it’s real enough. Saludos and thanks for stopping by! I totally agree, it’s magical. And, when I said “peaceful” I wasn’t really thinking about that sad story with the violence, which I think is generally disappearing in most areas, despite some incidents in states that, sadly, have a long history of violence themselves, such as Guerrero, poor Guerrero. When I said “peaceful” I was thinking of a placid, calm city where nothing happens and perhaps for this reason carries the risk of becoming boring. This is my very own impression, largely because Zacatecas rarely hits the news, or at least I seldom hear anything from Zacatecas here. Of course there is a cultural agenda, nice looking charros, beautiful colonial buildings, museums, the cable car offering a breathtaking view of the city and the Cerro de la Bufa, silver jewelry, the old mine… wait… I think I should go there once more and think again. I say this because sometimes I get tired of Monterrey, where more and more construction is going on, and though the city is getting a prettier face, it’s also getting crazier and crazier. Saludos, amigo. Thanks for follow up reply. I’m sorry you got held up in moderation. I think it’s because you used a new email address. And yes, I think I agree with you about it being peaceful. It definitely has a good vibe. As for things to do, I think Zacatecas has more to offer than you might think. There seems to be a decent calendar of events, and there are three high-quality museums. Of course it’ll never have the offerings of a DF or Monterrey, but for a city of its size, I think it has a lot going for it. Saludos y un fuerte abrazo. Gracias por tus comentarios. Enjoying the commentary as I plot to run away from home. My plan is to do some looking around (The plan is to check out Durango, take a third look at Mazatlan, and who knows what else in October) and eventually figure out where I want to try out a complete weather cycle and just rent a place for that project. Hey Marc! I’d be curious to hear of your experience/plans for running away from home. Though I’ve now lived in Boston for 20 years, I grew up on “The Peninsula,” (Woodside to be exact) so I’m well familiar with your climate. I also went to school in Houston. And what I can tell you from that is that it will take a *LOT* of acclimatization for you to be comfortable on the Mexican coast. Winter is fine, but the summer is very hot and humid, and unlike Houston (which has a similar climate), little is air conditioned, and electricity rates are quite high. That’s why I’m focusing my efforts on the central highlands, about which I’ve written fairly extensively. I’d also be eager to hear what you have to say about Durango. I’ve never been there, but from various pictures and Google Streetview, it looks nice, and is probably fairly inexpensive. Love your comments, Kim. Between heat in Pto. Vallarta and cold in DF, I have learned how air conditioning and heating is handled in Mexico! Hola Marc! So you’ve discovered that there’s little heat or air conditioning, then? LOL… I bought my ex, “F,” one of those portable gas heaters because it could get quite chilly in his apartment in DF on winter mornings, even though the day would turn out lovely. Saludos and thanks for stopping by! Looks like a very nice house and good construction at least from the pictures. I’m curious about the size of the house. How many square meters, bedrooms, baths, and is there any ground floor patio? The price looks great. Where can you buy a house (which looks quite large) for 100K? Here in Monterrey you would end up with a 125 meter house on a 100 meter lot in a gated community for much more than that. We are looking to head south and Zacatecas is on our list along with the state of Guanajuato. Drop me a mail if you can. A Mexican notary public will know if the papers are in order or not. Hola Chris! Somehow your comment ended up in the spam folder, probably due to the included e-mail address. In any case, as noted in the text, the house is claimed at 200 square meters (about 2,200 sq ft), though I did not measure it. There’s an interior patio about 3 meters x 3 meters that’s kind of dim due to 2 floors of walls above it. Currently the water heater lives there, though I would be tempted to hide it in the garage were I to actually purchase the property. (I’d put the washer and dryer in the garage too, as the roof deck is *way* too nice to be cluttered with laundry equipment.) Saludos and thanks for stopping by! What a great roof deck! Hola Andean! Yes, the roof deck is great, and the view is to die for. I wish I had taken some pictures when I was there, but all the photos shown came off the agent’s ad. Saludos and thanks for stopping by! Oh, as far as “perspective”… laundry rooms are better closer to bedroom areas. At my not so young age, I don’t know about so many stairs going to the living quarters (from looking at the pictures), with the exception of the lovely view..
Hola Andean! This place has a *lot* of stairs. There’s a bedroom on the garage/street level, then the living room/kitchen, then three bedrooms upstairs and finally the roof deck. Here in Boston I’ve got my laundry equipment in the basement and it’s a bit of a hike, but not too much trouble. Thanks for commenting! Kim, My advice is to pick the CITY you want to live in first. You will find a fabulous house in whatever city you choose, I promise. You’re doing it backwards this way. I think you are the kind of guy who would love Z for a while but would eventually find it too small a city. I also agree with various commenters that offering what you think is fair and being ready to walk away is a great plan. There are houses here in Mazatlan that we looked at when we were shopping eight years ago and they are still on the market and vacant. Some have had multiple price hikes, too. Hola Nancy!!! I think that’s very sage advice about picking the city first. I do love Zacatecas, but at some level I think (or fear) you’re probably right about me getting tired of it after a while. (I did after all title this piece The Ridiculous Real Estate Fantasy of Zacatecas, as at some level it is a smidgen ridiculous.) Still, I do love the city, and were I to live there, the place I showed would be just about ideal. There are tons of cheaper (and some more expensive) places in featureless suburbs far out, but if I’m going to be in a Mexican colonial city, I’m going to be in the thick of things. That said, a place in Zacatecas does not rule out going the “John Calypso route” and having more than one place, but I probably should start in DF and work my way out if that is to be the plan. As for your point on unsold real estate with multiple price hikes, you’ve got to wonder exactly what world those sellers live in. At some level they must not really want to sell properties, even when vacant. That mystifies me, and I’m not eager to try to deal with such people. All that said, I have spent some more time this weekend looking at listings on property in Zac, and the seller of “my” property isn’t probably too too far off the mark in terms of price, though raising it isn’t likely to be what ultimately moves the house either. Anyway, saludos and thanks for stopping by! Being an owner of three Mexico properties I say go for it 😉 One of the great things about Mexican property is the low cost to have it in your inventory: low taxes; low utilities at rest (no high monthly connect fees); inexpensive gardeners and house keepers etc. I like the 20% low offer idea – although the Mexican seller can get insulted pretty easily. Seems like a great time to buy – I love real estate! Hola John! I was thinking of you and your multiple properties while writing this. The fact of the matter is that I could follow your trail and have a place in Zacatecas, but also have other places. And one of the things about that place in particular is that it looks like it would be fairly “defensible” in my absence, appearing to be pretty difficult to break into. And yes, I like the idea of having some more real estate. While I’m not worried about inflation now, it seems like a lot of the pieces are in place for a nasty inflation to develop in the future. And I’m also with you on the politics of a “lowball offer.” I don’t want to piss off anyone, but do want to negotiate. If I get serious, I’m going to recruit the help of my Mexican lawyer on how to handle all that. Nice to see you back, amigo! I think Zacatecas, like Guanajuato or a few of the other old mining towns have a ton of appeal. I could really see myself just settling into a nice apartment for six months or so to enjoy the peace and solitude. Take a break from it all. I’m not sure I could see myself staying there much beyond that six months though. There’d get a point when I’d really want to get back to the bustle, diversity and smog of DF…. And a six hour bus journey is too much for my British tastes. Hola Gary! You raise a very good point, one I think about. Buying a place in Zacatecas doesn’t necessarily rule out a second place in DF, epecially if I actually commit to Mexico and sell my place here. But it is a biggish commitment. That, of course, is why I’d like to pay as much of a market price as possible. (“Market price” in my mind means the place can be resold at a similar price within 6 months or less.) Otherwise, if I were interested in remaining in Zacatecas until I shuffled off this mortal coil, the price would be less important. Anyway, good to hear from you and thanks for commenting! Saludos! The house looks nice, and the price is a bargain (even by Cleveland standards where real estate prices are much lower than in Boston). Heck, even this retired school teacher could afford the place! I think you should follow the advice of a previous poster. See if they would be willing to rent the house to you for a period of time. Zacatecas may be a wonderful place to visit… but before making the leap you need to know for sure if you would be happy LIVING there. A few days there during a road trip is not enough time to know if Zacatecas is a good fit. That’s my two cents, but then I tend to be cautious and practical. P.S. Great to see you posting after a long hiatus! Hola Bill! Yes, the price is quite reasonable compared to any city in the USA. There may be some places in Texas or Louisiana where you could get a house for that price, but it wouldn’t be in as interesting a place, nor would it be as nice. And yes, your points are all well-taken, though I think I have spent a total of about two or two-and-a-half weeks in Zacatecas, but still, that’s not *much* time. I’m also realizing that I need to get to know the rest of the city a bit better. I know the tourist/World Heritage Site part pretty well, but I don’t have much of a clue about the more modern bits, though from various photos I’ve seen, they aren’t nearly as charming. The other thing that occurred to me is that I should try to learn what it would cost to build such a place. That, probably more than anything, could give me an insight into the fairness of the asking price. 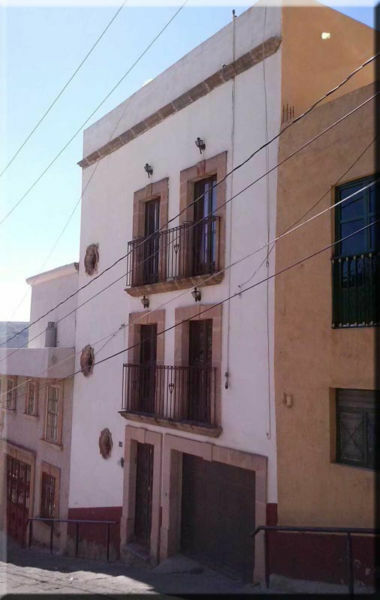 If you wander around Zacatecas, particularly on the other side of Hidalgo (the main drag), you’ll find a certain number of new houses, designed (like the one featured in this post) to look antique. So finding out what building costs would be should be fairly easy. Also when I was there last year, just below the house someone was building what looked like a condo complex. I should check that out too. How nice that you’re back! I know the feeling well when something gets ahold of you and won’t let go. I say offer $75,000. USD and then walk away. They’ll come to you, wait and see. Hola Barbara, Thanks for the kind comment. I love your approach. Simple and to the point! Saludos! I don’t know Barbara, but I like the way she thinks! As for me, I’m the last person who should be giving real estate advice. My heart overrules my head, and who knows how that will turn out! I’m glad to see the blog is back. Look at all the comments you got after such a long period of silence. That really says something. Hola Lee! Indeed, I am both amazed and delighted that people will still come by to read my musings, especially in light of the fact that I’ve become a *very* sporadic blogger. And, frankly, the folks here have helped me clarify my thoughts about this whole process. Given your own impulsive real estate purchase, I was very curious about what you had to say. OK. Here is my take. I would tell most people who are interested in moving to Mexico that they were stark raving NUTS to purchase a house on first moving south. But you are no neophyte. Your visits in various areas of the country have given you objective facts on which to make a decision. Given that, I still think it would be wiser for you to rent somewhere. You might look into a lease-purchase option for this house. That would give you some additional stage time to draw out your Hamlet soliloquy. My bottom line is pick a date and just do it. It worked for me. And here I am sitting in my pool commenting about life in Mexico. Hola Steve! Wise words as always. I hadn’t thought about offering to rent the house for a spell. There are pros and cons to that idea. Easy exit is the biggest pro. But the cons are that I’d have to live with the place as it is, and then risk having a bunch of furniture with no home were I to decide it wasn’t for me. But I suppose that’s better than owning the house with the same furniture. Decisions, decisions…. Saludos and thanks for commenting! I could move into that house, as is, and like it. But after a while, I’d want to make some small changes. OTOH, it’s kind of big for a single person, and mabe too big for a couple. Hola Don Cuevas! You know, I could probably do the same. It’s a fine house overall, if maybe a bit large. It’s very vertical, because counting the garage level, where there’s one of the bedrooms, along with the roof deck (which I’d *definitely* use often) there are four levels to deal with. The one thing on the kitchen, though, is I think I’d really want a better stove. And it would also be nice to put a stove and wet bar/sink in the “laundry room” up on the roof deck. That way it’d be easy to have a party up there. Saludos and thanks for stopping by ! If it checks out, offer 20% below the first price and tell them you have no desire to start life in town under water. Go from there. Good luck. Hola Norm! Good points you raise, all of them. The realtor made a point of telling me that all the papers were in order, and while I’m not an expert, I did look carefully for signs of settling, cracks, etc, and didn’t see any. On the neighbors, I did less due diligence. The houses across the street are pretty basic and have some graffiti on them, so that could be an issue. As for offering 20% less, I always wonder about where to start. People can get emotionally wrapped up in selling stuff, particularly a house. So I don’t want anyone to get upset about a price. Of course, if they’re serious, they’ll come back with a counter, even if it’s full price. At the moment, I’m going to bide my time. If Greece defaults, the USD probably goes up even more, so time is on my side. Saludos and thanks for your comment. Why not buy it with the intention to rent it out as an airbnb or other vacation rental? You could have fun remodeling and then rent it most of the time on short term rentals and go there yourself when the mood hit you. I do not recommend uprooting yourself selling your Boston house and moving there permanently until you have lived there temporarily for awhile. But that doesn’t mean you couldn’t buy it. I am sure the asking price is far above what they will accept. Hola Christine! Good point, and I actually did think of that. I looked on airbnb yesterday, and there’s one house in Zacatecas available. 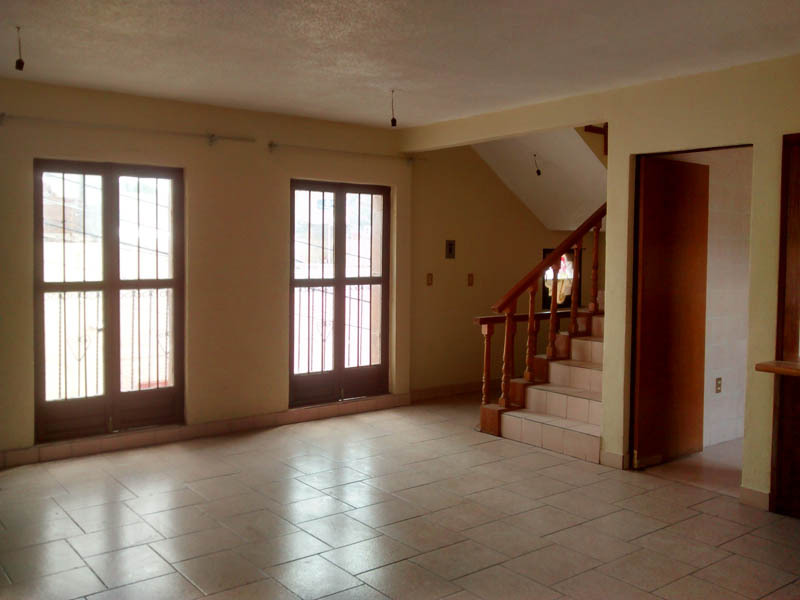 It’s 4 bedrooms and rents for $65USD per night, but isn’t nearly as nice as the house I’m considering, and about a fifteen minute walk to the Zócalo, compared to about a minute from “my” house. And there’s even a way I could do that and still stay in the house as one of the bedrooms is on the lower floor, below the living room, and it’d be *very* easy to turn that into a studio apartment and thereby sort of let me have my cake and eat it too. Saludos and thanks for commenting. My wife, who traveled all over Mexico during her days as a civil engineer for the Mexican highway department, says Zacatecas is her favorite Mexican city. There is no Gringo community there to speak of, if at all, but I count that as a plus, especially since you talk Mexican pretty good. It is the second highest major city in Mexico after Toluca. It gets quite cold in the winter (altitude) and quite hot in the summer (desert). I think that’s mostly what keeps Gringos away, even though I recall you found some temp statistics once that countered my take, a take I’m sticking with. It’s the northernmost Colonial city in Mexico, and not a fer piece from the Texas border, which is a plus, I think. I visited Zacatecas just once. I liked it, but I did not love it. I predict you will stay in Boston full-time, leaving this a dream. I’d put money on it. Hola Felipe! If my impulsive side wins out, you and your wife will be welcome to come and stay a spell any time you wish. If you’re lucky, I’ll even be in the USA at the time, LOL. As you note, my language skills permit me to live easily anywhere in the Spanish-speaking world, so the lack of expats would only be a lack of gringo community. But I don’t hang too much with gringos SOB anyway. On distance, it’s about an eight-hour drive to Laredo, depending on whether you get stuck on Monterrey traffic or not. As for climate, according to the table in Wikipedia, the average high in the hottest month, May, is ~80°F, while the average low in the coldest month, January, is ~41°. Now, averages are one thing, and there are certainly hot days, though it’s a dry heat. And the same observation goes for cold. In all likelihood, I’ll miss the extreme heat as I love Boston’s summer, and the cold will be nothing compared to here. And as for your bet, just don’t bet too much. Saludos! The price increase in pesos absolutely does not mean that the seller is unreasonable. This happens all the time. Hey, even new cars cost more this year than last. It’s still cheaper for you this year, even with the price increase, than it was last year. Buy the place. You need a project, you’re not getting any younger, and it’s time to leave the E.U.A. Hola Jennifer! Even my practical side thinks you are probably right about just plunging in. And as for the house, at the very least, you’d think the seller would accept the old price, especially if presented nicely and persuasively. When I bought my house here in Boston, I had competition, but won out by sharing my vision for restoring the house with the then-owner who really liked the idea. Saludos and thanks for your thoughts! It is common here to raise prices when something is not selling. It makes, of course, not a lick of sense, but much of Mexican life makes no sense whatsoever. Some folks find that charming. I have to wonder if it ever works. It flies in the face of both economics and common sense. I was about to tell you what Felipe just told you. When we found our house we told the realtor what we would pay. She said the seller would not come down that much but about 3 months later she called and said if we were still interested he would sell at that price because he wanted to get his money out of it for another project. So don’t be afraid to offer something lower. Thanks Billie! As much as I have fantasized about Zacatecas in general and that place in particular, Felipe can attest to the fact that I’m not likely to move at lightning speed, LOL. When I first met with the realtor, she told me that sales over a million pesos in Zacatecas had been pretty slow anyway. And though I’ve heard legion tales of prices raised in property that doesn’t sell, it still strikes me as an unsuccessful tactic, at least if what you want is a transaction. Saludos and thanks for stopping by! You don’t think the seller is aware of the devaluation of the peso? The seller wants to walk away with the same US dollar value, or something approximating that, today that he would’ve a year ago. You’re aware that the seller’s actually reduced the price in dollar terms. The seller may well be able to afford to let the house sit on the market, because it’s an investment, and it’s not encumbered. Sellers in this country just aren’t as desperate to make that sale as those in the EUA. The seller can usually afford to let the property sit until a buyer comes along prepared to pay his price. While we in Mexico may bargain over relatively inexpensive things, car and real estate sales just don’t have the level of bargaining that you may have been accustomed to back in the Old Country. Don’t even think about using it as an Air BnB or vacation rental unless you’re on-site or have a reliable property manager. But whether it’s this house or another one, it is time for you to set down some roots in Mexico. Wherever you’ll land, you have to be prepared to bloom where you’re planted. Hola Jennifer! I have no view on the seller’s information about the peso. However, in Mexico City I have seen plenty of listings specifically priced in USD. Mostly those are very high end, over $500,000 USD, which this property is not. But whatever the seller thinks about the peso exchange rate, his property is in Mexico, and (unless I’m mistaken) is most likely to be purchased by a Mexican national. And all of the comparables are priced in pesos, so to me it seems as reasonable for him to expect a constant value on USD as it would be for me to expect a constant value of my own house in Swiss francs. Yes, I realize it’s not a perfect analogy, but Zacatecas is very much a local market, unlike, say, San Miguel de Allende, Ajijic, or various beach communities. In any case, I feel pretty “ready to bloom” wherever I land. As you know, my Spanish is fluent, and I know the country and customs well. And thanks for the airbnb tip. Saludos! I think it’s a leap to believe the price change is related to the dollar. Could be. Most Mexicans think and live by the peso. I bet it’s just another loony example of raising the price due to its not selling. I certainly agree that renting a property that you own in Mexico from afar would be nutty, especially if you’re targeting Mexican tenants, which I would not do. And finding a “reliable” property manager would be a very long shot. Felipe: I think I’m going to agree with you on all points. Saludos. Keep noodling. Make a trip there. Hang out a lot. See if U would be happy part time there. Hey David! That’s good advice. And it’s certainly the default plan. Yet I keep fantasizing about that house in particular because it has a terrific location, and a nice combination of practical modernity inside and a colonial-ish look on the outside. Saludos and thanks for stopping by! P.S. You are especially right about the part-time thing. I’m not thinking about selling my place here, so it’d be more of a winter/spring getaway, at least initially.